I sat down with our very own Adil Hussain to chat about The Chat Shop (get it? ), live chat outsourcing, and karaoke. 1. Tell us about your background. I grew up aspiring to be a singer but after coming to the realisation that I was tone deaf I settled for the next best thing….studying law. During my studies, I developed an interest in Start-ups, technology and customer experience. This led me to join JUST EAT, Quiqup and a couple other tech startups focused on utilising technology to provide customers and businesses value. 2. How did you learn about The Chat Shop? From a Job ad they posted online. No interesting story here I’m afraid. 3. Why did you decide to join The Chat Shop? I joined The Chat Shop for two main reasons. Firstly, the people. The team (both in the office and around the world) have all been very welcoming, supportive and a joy to work with. Never have I enjoyed working with a bunch of people as much as I do now. 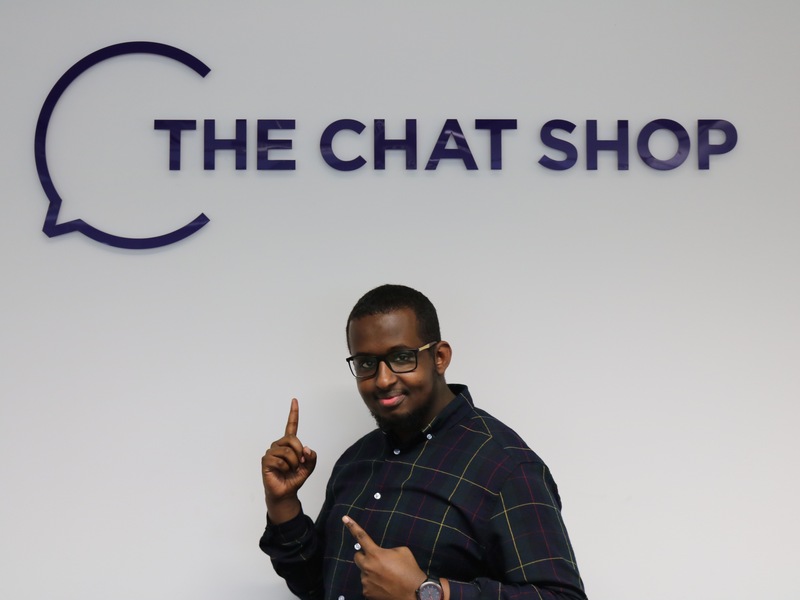 Secondly, In a day and age where technology is changing the way we interact with business and buy products, The Chat Shop’s aim of helping businesses transform their digital communication has never been more crucial. Customer experience is and will continue to be the differentiator and I look forward to working with businesses to nail their customer experience. 4. How have you enjoyed your job so far? I’ve really enjoyed working with the diverse, international client base and the challenges that brings. I’ve also learnt more about google analytics, google tag manager and digital strategy during my short time here at The Chat Shop than ever before. The shorter commute is also a plus! 5. What do you want to accomplish at The Chat Shop? As I said, customer experience is becoming the new battleground for businesses and the key to retaining customers. I would like to work with more clients – especially those still utilising outdated methods – and help them transform their digital communication strategy as well as providing an unbeatable ROI. 6. What have you learned from your career before The Chat Shop? The importance of providing value. Having had the fortune of gaining first hand experience both in companies that have IPO’d as well as companies that have gone under, it’s evident that the key to success and prospering is constantly providing value to your end customer, to the organisation you’re in, to your immediate team and to yourself (in the form of learning and self-education). 7. What will be your short-term focus at The Chat Shop? Staying in tune with my clients and looking for areas of improvement to ensure I’m providing them with the best ROI possible. I’m also looking forward to getting creative with proactive strategies and increasing engagement across the board. 8. What do you do for fun outside of work? Karaoke (the dream of becoming a singer is still going strong). I also enjoy observing beautiful scenery and going for walks while listening to audiobooks …Thank God and Jeff Bezos for Audible! Adil Hussain in his natural habitat.